Tendons are made up of strands of a material called collagen. 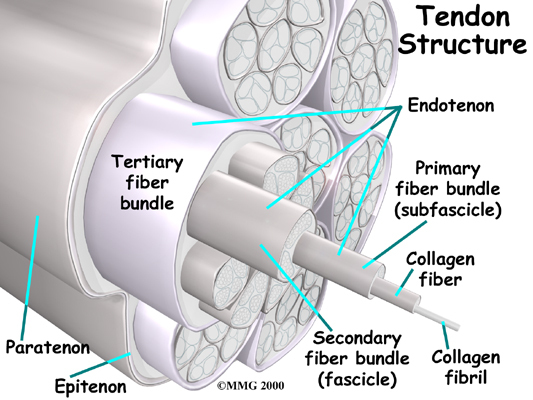 Think of a tendon as similar to a nylon rope and the strands of collagen as the nylon strands. As we age, or repetitively use the tendon, some of the individual strands of the tendon can degenerate, lose normal arrangement due to the degeneration, or break, and the tendon loses strength. How do posterior tibial tendon problems of the foot develop? 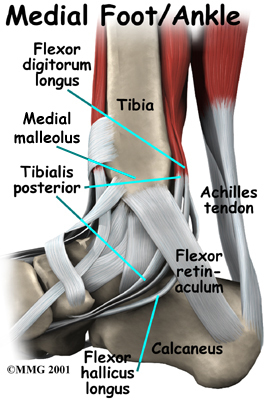 Multiple factors can contribute to posterior tibial tendon problems. Patients with flat feet are at a higher risk of having a posterior tibial tendon problem because of the persistent stretch on the tendon. 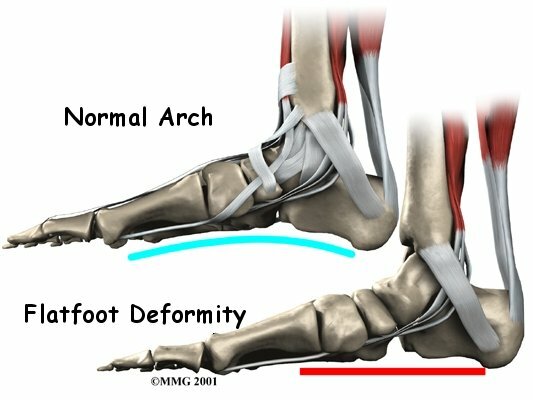 Having flat feet can contribute to posterior tibial tendon problems, but conversely, posterior tibial tendon problems can lead to the medial arch of the foot dropping causing a flat foot. Injury to the nerves of the foot, bones of the foot, or having laxity (looseness) of the ligaments on the medial side of the foot can all result in deformity of the foot and/or ankle resulting in the posterior tibial tendon being more stressed. The posterior tibial tendon can even be directly affected by systemic diseases such as diabetes, rheumatoid arthritis, and high blood pressure, or from the prolonged use of steroids. These diseases cause either increased laxity in the ligaments of the foot, which affects the foot biomechanics, or they directly affect the blood supply to the posterior tibial muscle and tendon, and contribute to the problem in that regard. Obesity is another factor that can cause problems with the posterior tibial tendon. The excess weight causes pressure on the foot and particularly on the posterior tibial tendon as it struggles to support the medial arch under the extra weight. Poor alignment of the lower extremities in any patient can also lead to pain in the posterior tibial tendon as the alignment forces undue stress down the medial side of the foot. 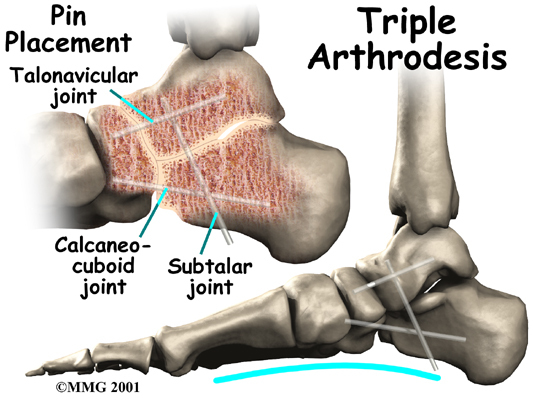 Problems with the posterior tibial tendon seem to occur in stages. Initially, irritation of the outer covering of the tendon, called the paratenon, causes paratendonitis. This means that there is inflammation between the lining of the tendon and the tendon itself where it runs through the tunnel behind the medial malleolus. This tendonitis can start a process of wear and tear on the tendon fibers. As the tendon heals itself from wear and tear, scar tissue forms, thickening the tendon. This process can continue to the extent that a nodule, or knot, forms within the tendon. Once the painful tendon has changed in structure, the term tendonosis, rather than tendonitis, is used. Unlike with tendonitis, recent evidence shows that inflammation is not present with tendonosis. 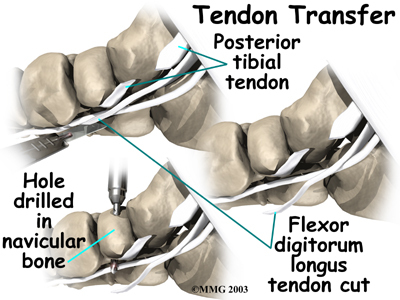 The area of structural change in the tendon is weaker than normal tendon. The weakened tendon sets the stage for the possibility of rupture of the tendon. 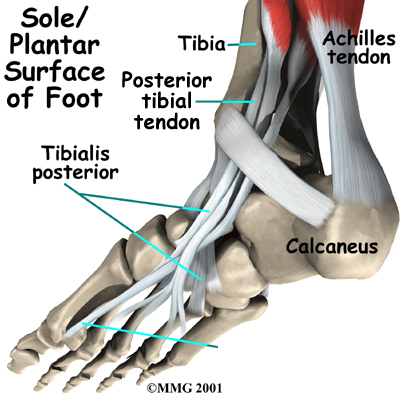 The symptoms of tendonitis of the posterior tibial tendon include pain in the instep area of the foot and swelling along the course of the tendon. In some cases the tendon may rupture due to the degeneration of the tendon. Rupture of the tendon leads to a fairly pronounced flat foot deformity that is easily recognizable. In addition, a patient with a ruptured tendon is unable to rise up very high onto their toes, which also leads to the suspicion of a ruptured tendon. 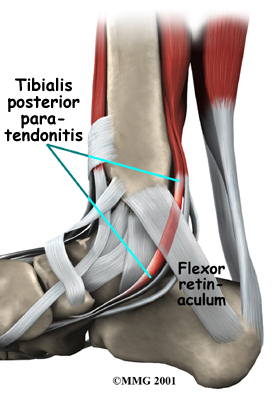 How do health care professionals identify posterior tibial tendonitis? The history and physical examination are probably the most important tools that health care professionals, including your Physical Therapist at Purposed Physical Therapy, will use to diagnose this problem. Your therapist will want to know exactly where your pain is, when it started, and what activities ease or aggravate your symptoms. Next your Physical Therapist will physically examine your foot and entire lower extremity. They will palpate, or touch, around your area of discomfort to determine the exact location of pain. The alignment of your hips, knees, ankles and feet will be observed in both standing and sitting. You may be asked to twist your body with your feet planted on the ground, squat, or walk without shoes so your therapist can observe your feet and arches as you move. Next your Physical Therapist will assess the position and mobility of the bones of your feet to determine if there is any subluxation, laxity, or even stiffness in any part of the ankle or foot, which may be contributing to your problem. The strength in the muscles of the foot and lower leg will also be assessed. In addition, your Physical Therapist will assess the strength in the muscles of your hip, as these muscles also play a part in controlling the alignment of your lower leg as well as lifting the arch of your foot. The biomechanical link between the hip and foot can be felt if you stand relaxed and squeeze both buttocks muscles together. As you do this you will feel the arches of your feet slightly lift. It is for this reason that control around the foot cannot only be left to the joints and muscles directly connected to or in the foot. The strong hip muscles will also need assessing and addressing if they are shown to be weak or inadequately functioning. Muscle testing helps identify any areas of weakness or muscle impairment and imbalance. This will be done in both the weight bearing and non-weight bearing positions. As briefly mentioned above, an important test that can help identify insufficiency of the posterior tibial tendon is the single heel raise. You therapist will ask you to stand on one foot and rise up on your toes. You should be able to lift your heel off the ground easily while keeping the heel bone (calcaneus) centered and slightly turned inward (inverted) and your knees straight. If you cannot, your posterior tibialis muscle and tendon may be ruptured. 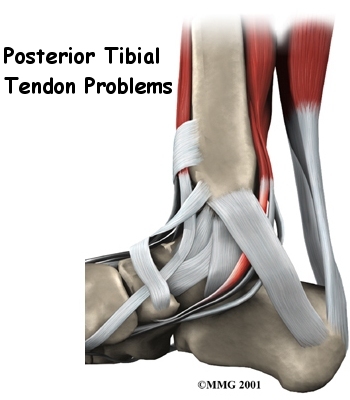 Posterior tibial tendon problems are usually apparent on physical examination. In some difficult cases, however, a magnetic resonance imaging (MRI) scan may be necessary to confirm whether the tendon has ruptured. The MRI machine uses magnetic waves rather than X-rays to show the soft tissues of the body. The MRI creates images that look like slices and shows the tendons and ligaments very clearly. This test does not require any needles or special dye and is painless. Your doctor may prescribe anti-inflammatory medications, such as ibuprofen or aspirin if you are in the stage of injury where inflammation is a culprit. A cortisone injection, sometimes used to ease inflammation in other types of injuries, is usually not appropriate for this condition, since the tendon is more likely to rupture following injection. Some physicians recommend a slightly different cortisone treatment, other than injection, called iontophoresis. Iontophoresis is a treatment that uses electric current to deliver cortisone medicine through the skin to the inflamed tendon. The risk of tendon rupture is much less when this method is used. Physical Therapy at Purposed Physical Therapy is extremely beneficial in treating posterior tibial problems. During your first few treatments at Purposed Physical Therapy your Physical Therapist will focus on relieving your pain. They may use ice, heat, ultrasound, or other electrical modalities on the instep of your foot or up the medial shin to provide you with relief. Icing or heating these areas at home will provide similar relief. Your therapist may also massage the bottom of your foot, calf, and muscles around your shin. Massage can be particularly useful in relieving your discomfort. Unfortunately these types of treatments only provide temporary relief; addressing the real problem of why the posterior tibial tendon is being stressed will provide more long-term relief to your injury and help to avoid an irritated tendon from developing into a chronic problem, or from rupturing. Physical Therapy exercises will begin with strengthening exercises for the small muscles of your foot and posterior tibialis muscle. As mentioned above, these muscles work to lift and support the arch of the foot, along with the muscles of the hip, which control alignment down the lower leg chain, and also assist in lifting the arch of the foot. A Theraband may be used to provide added resistance to the muscles of the foot, and to strengthen the hip muscles. Your therapist will also prescribe stretching exercises, particularly for the muscles of your calf, which, when tight, can force the foot out of alignment. When performing all stretches it is imperative that you maintain proper alignment of your foot and arch so as not to compound the forces going through an already irritated posterior tibial tendon. Your Physical Therapist will give you feedback on whether or not your alignment during your exercises is sufficient. Being that posterior tibial tendon problems tend to develop over time, it is common for patients to not even notice that their feet may be flat or their alignment is off. The position of your feet becomes the ‘new normal.’ Re-learning the proper position of your arch is crucial to relieving the pain in your posterior tibial tendon as well as stopping the progression of the tendon problem and preventing a resultant deformity developing in the foot. Proprioception is the term used to describe one’s sense of joint position. Your Physical Therapist will teach you what the correct position of your foot and arch should be and will give you exercises that challenge the proprioception of your knee, foot, ankle, and arch. Initially these exercises may be while you are simply sitting but as you progress, your Physical Therapist will advance your exercises so you are doing them in standing, and eventually just on one foot at a time. The standing position is an important position to work up to as it is much more functional in mimicking normal everyday activities such as walking or stair climbing. Eventually your Physical Therapist will prescribe exercises that are extremely challenging, especially if you are involved in a high-level sport. Exercises such as squatting and jumping will be added and you will be required to do these activities while maintaining proper foot, arch and leg alignment. If you have not already invested in some orthotics to assist with supporting your arch and taking some pressure off of your posterior tibial tendon your Physical Therapist will advise you on whether you should purchase some, and where to do this. Often taping the bottom of the foot, which your Physical Therapist can do, and can teach you to do on your own, can be trialed before expensive orthotics are purchased. Taping may be enough in mild cases of posterior tibial tendon pain, as long as you can learn to control the position of your foot and maintain this position during high-level activities. In most cases shoe inserts, even pre-fabricated ones, will significantly improve the symptoms of a posterior tibial tendon problem, and will be recommended to both relief symptoms and to avoid any progression of the injury. Custom fit orthotics are recommended for any individuals who have a significant flattened arch, or for whom prefabricated ones do not relieve their symptoms. As mentioned above, excess weight can be the cause of posterior tibial tendon problems. Losing excess weight can greatly improve the pain you feel in your foot and make it easier to maintain normal foot alignment during everyday activities. Your Physical Therapist at Purposed Physical Therapy can discuss weight loss strategies with you and if need be, refer you to a Nutritionist who can also assist with this goal. Often it is difficult to exercise and increase your energy expenditure to lose weight when you have a painful foot, however, there are several safe activity options that your therapist can discuss with you, such as stationary cycling or swimming. Activity modification is an important part of our treatment for posterior tibial problems at Purposed Physical Therapy. Your Physical Therapist will strongly advise you to avoid any activities that cause you discomfort while you still have symptoms. This may also mean resting for a short period from any sport you do, or at least decreasing your amount of activity over a period of time. Your Physical Therapist will specifically guide you regarding the needed rest for your individual injury. This rest may seem quite difficult to achieve, however it is well known that without a relative rest for a painful foot, there is little chance for it to heal. A period of rest where the foot is not being aggravated also greatly improves the ability of any medication you may be taking, along with the Physical Therapy treatment you are receiving, to assist the healing of the injury. Your Physical Therapist will advise you when it is safe to slowly start back at your activity after your period of rest. Unfortunately, not all posterior tibial tendon problems will respond to the Physical Therapy treatment we provide at Purposed Physical Therapy. If your symptoms persist or it appears that your foot is not responding to the treatment the way that your Physical Therapist would expect it to your Physical Therapist will refer you on to your family physician or an Orthopaedic Surgeon to discuss a more aggressive form of treatment. 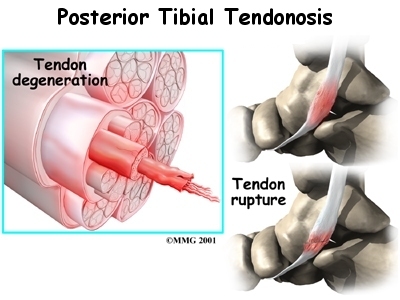 A degenerated tendon that has not ruptured may only need to be repaired and not reattached. The surgeon divides the sheath around the tendon. 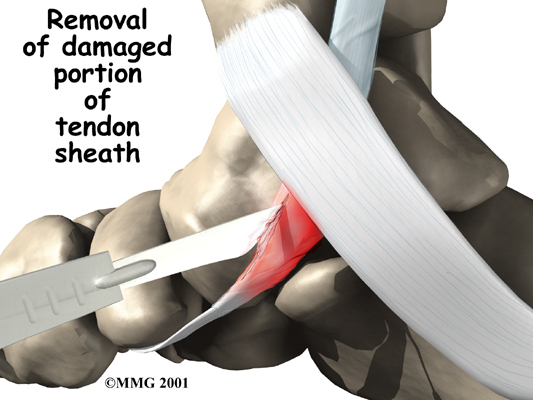 Areas where the tendon is degenerated are carefully removed. Tears within the tendon are sutured along the length of the tendon. If the surgeon is concerned that the repaired tendon is at risk for rupturing, a graft procedure to add strength to the tendon may be needed (described below). The tendon sheath is repaired, and the skin is closed with sutures. You will likely wear a bandage or dressing for about a week following a surgical procedure for your posterior tibial tendon problem. The stitches will be removed in 10 to 14 days. If your surgeon used dissolvable stitches, these will not need to be removed. It will take about eight weeks before the soft tissues are well healed after surgery. 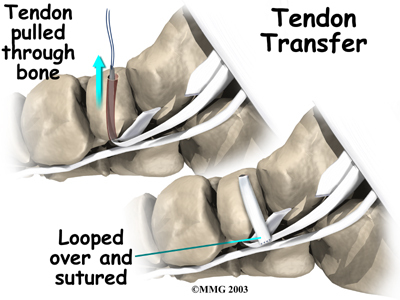 Simple debridement of the tendon takes much less time for the tendon to heal. If the tendon has been repaired or grafted, you will be placed in a cast or cast boot during this period to protect the tendon while it heals. You will probably need crutches as well. A Physical Therapist in the hospital will teach you how to properly use the crutches on level ground as well as on stairs. %Physiotherapy at Purposed Physical Therapy can begin as soon as your surgeon indicates that it is safe to begin. Most often this is after the 8-week mark. Post-surgical rehabilitation at Purposed Physical Therapy will initially focus on minimizing the pain and swelling from the surgery. Similar to non-surgical rehabilitation, your Physical Therapist may use modalities such as ice, ultrasound, or interferential current to accomplish this. They may also use gentle massage around the muscles of your foot and lower leg. Your Physical Therapist will guide you on when to increase the weight-bearing load on your surgical foot by using the crutches less. You will likely move from using two crutches down to just one, or a cane or stick, before going without any aid at all and putting full weight through your surgical foot. Walking as normally as possible before going without any walking aid is imperative. It is easy to develop compensatory walking patterns that cause other injuries if you stop using your walking aid too early. One of the first exercises your Physical Therapist will prescribe post-surgically will be some gentle range of motion exercises for your foot and ankle to gradually regain full movement and to help decrease the swelling. These exercises may be as simple as ankle circles and also pointing and pulling your toes and foot upward. The exercises should be done within a relatively pain-free motion, however, movement will be encouraged even if it causes a slight bit of discomfort as the movement itself can greatly assist with dispersing any swelling as well as improving the overall level of pain. Elevating your foot as often as possible in these early stages can also assist greatly with removing any swelling from the ankle. It is best, if you can, to elevate your foot higher than your heart to allow gravity to assist with the fluid drainage. If you have a stationary cycle you will be encouraged to use it. A stationary bicycle can be very useful in the initial stages post-surgically to assist with gaining ankle range of motion and decreasing swelling. Even if you are unable to fully rotate the pedals, the back and forth motion on the bike is an excellent method of slowly encouraging the ankle to regain its full range of motion. If you have access to a pool or whirlpool, your Physical Therapist may also encourage you to do your exercises in the pool , once the surgical wound heals. Weight bearing in the pool is easier and the warmth of the water can assist with range of motion. As soon as you begin treatment at Purposed Physical Therapy your Physical Therapist will immediately prescribe exercises that address the proprioception of your foot, ankle and leg, as well as the alignment of the entire lower limb. Regaining a feel for the proper position of your foot and arch is crucial to avoiding a recurrence of your symptoms. Simple strengthening exercises for the bottom of your foot, posterior tibial muscle, as well as your hip muscles will also begin early on. Again, all exercises should be done within a relatively pain-free range of motion, however, some mild discomfort at the end ranges of motion may be felt as you begin to strengthen the muscles within their new range of motion. As stressed under non-surgical rehabilitation above, It is crucial that you pay particular attention to the alignment of your arch, foot, ankle, and lower limb as you perform any of the exercises your Physical Therapist prescribes. Poor alignment of any of these areas can begin re-creating a situation where you are again prone to posterior tibial tendon symptoms. Your Physical Therapist will repeatedly remind you to be conscious of the overall alignment of the entire lower limb during both the rehabilitation exercises you do at Purposed Physical Therapy as well during everyday activities such as walking and stair climbing. Significant improvement in your foot after surgery occurs gradually over a four-to-six month period of time. During that time, your Physical Therapist will progress your exercise program, but your appointments at Purposed Physical Therapy will decrease in frequency. For those patients who have had a fusion, there will be stiffness and loss of motion in the foot and/or ankle, so this should be expected. The amount and location of the stiffness depends on which bones were fused together. Some prolonged swelling and discomfort are not uncommon even six to 10 months after surgery for this problem. Standing on your feet for a long time or walking long distances can also cause foot pain or discomfort. Eventually these symptoms will disperse. Returning to regular activities will also occur slowly over a period of approximately 4-6 months. Your Physical Therapist will guide you regarding the appropriate time to add more aggressive activities to your exercise and rehabilitation regime. If you are eager early on to get back to some cardiovascular activity, your Physical Therapist can advise you regarding a safe intensity and duration of non-weight bearing cardiovascular activities such as swimming or cycling, and will also advise you on when it is safe to return to more aggressive activities for your foot and ankle such as jogging. Generally post-surgical rehabilitation for posterior tibial tendon problems at Purposed Physical Therapy goes extremely well, however, if your pain lasts longer than it should or your rehabilitation is not progressing as quickly as your Physical Therapist feels it should be, they will ask you to follow up with your surgeon to ensure there are no complicating factors impeding your recovery.